The STI Clinic can offer four tests from one tiny blood sample that you can collect at home. Only a very small amount of blood from a finger prick test is required to give an accurate result for HIV, Syphilis, Hepatitis B and Hepatitis C.
If you order a test before 5 pm Monday to Friday then you could have the kit delivered the next morning. 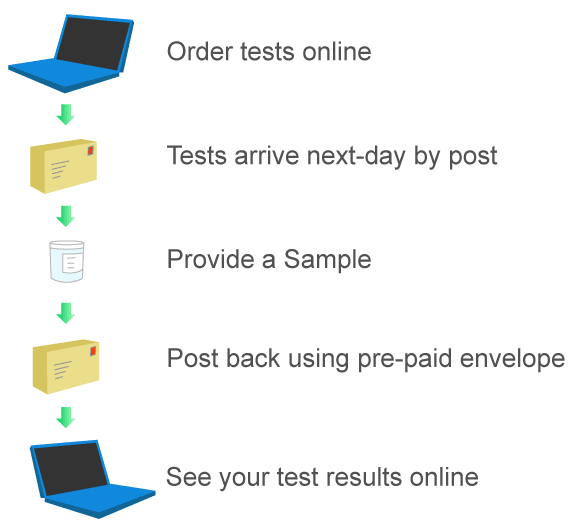 After you send the kit back to our lab in the paid envelope provided, you will have your results within 4 hours of the sample being received. The antigens that we are looking for can appear from 10 days after exposure so this would be the soonest reasonable time to get tested if you are concerned about only one sexual event. The antigens can take longer than 10 days to appear and we will always recommend getting retested around 6 weeks after potential exposure for HIV as this is the longest that we would expect it to take for the p24 antigen to be expressed in your blood. We advocate getting tested at the earliest sensible opportunity and not waiting for 6 weeks. What happens if I am positive? We will interpret your results for you and put them into plain English. If any of your results indicate that you have tested positive for any of the infections then we will need to recommend that you see a healthcare professional face to face to have the result confirmed from a venous sample. We do not provide treatments for any of the infections covered by the Quad STI Blood Test as they require careful management in a face to face environment. Who is this test suitable for? The Quad STI Blood Test can be taken by anyone. If you want to rule out the possibility of having HIV, Syphilis, Hepatitis B and Hepatitis C then this test would be appropriate. If you are concerned about other infections, we have the Full Screen Plus available that can identify 11 different infections.